Hi! It’s Christa. I just finished treatment and wanted to share some things with you. Hopefully you are all doing as well as can be expected. I just had a pretty scary recurrence. The three spots in my brain on March 28th’s scan (that was one spot in the September scan that had me running to the MRI after no signs of disease) had turned to 40 spots in two hemispheres in May. I didn’t really tell many people how serious it was because the medical doctors told me when breast cancer spreads to the brain that takes you down to 6 months. With treatment. It’s ok! That was May this is July. Things are completely different now and I made it through the hard part. We decided to go ahead and remove my ovaries and get me on a regular hormone therapy. My breast cancer tissue sample revealed that it’s 100% hormone positive which is actually a good thing. It means I have options to treat it… that isn’t chemotherapy. I got on the surgery schedule and had my ovaries removed July 8th and have been on hormone therapy since June. As will most cancer treatments especially in the U.S. medical system the treatments will kill you or cause a lot of damage, so I really try to minimize what I’m doing. How do I know? I don’t. I just try. I sit quietly and count my breaths for as long as I can every morning when I wake up and every evening when the sun is going down. Then I trust my hunches. I think some people call it “listening to your body” but I mean it’s not like we can HEAR the body tell us things. You really have to quiet your mind. I just hope you can, I know it’s scary. When they radiate your whole brain it compounds- similar to chemotherapy. You slowly start to feel burned from the inside out. The dizziness and vomitting is unreal, and very hard to manage because you can’t keep the anti-nausea meds (Zofran and a steroid) down. Especially first thing in the morning. I just resolved to allow my body to convulse in the morning then blend a frozen banana with chia seeds and almond butter and oats and sip it alternating with boiled ginger water. That would settle my stomach long enough to take the meds. The pain from radiation is more real than the hormone therapy. When it starts to compound and your ears and eyes get affected it’s a very dry, cracked, chemical sunburn feeling from the inside out. You won’t look as bad as you feel, but it’s still painful. The RSO really helped me with that. The hormone therapy side effects you may know can be brutal. They aren’t as “accepted” because it’s mostly emotional and sleep health even though the effects of those things are very real and can very quickly kill you. I have found a natural way to ease those side effects as well. It might be the RSO but I also am sitting still for 20 minutes when I wake up and at sunset with this Fisher Wallace Helmet. You can learn about it here, and even though it’s approved by the FDA it’s still a bit pricey but worth the spend so far (and thank you those that have supported me this treatment). I am also visiting with many spiritual healers and energy workers to address any energy issues I might be hanging on to. Why not right? I have found some amazing break-throughs with this through Michael and Alesia’s light alchemy. I really didn’t want to ever take too many U.S. medicine meds. I don’t know why, I just don’t. So I registered and received my 329 Medical Marijuana card and have been using RSO three times a day for the past month. It took some getting used to but absolutely helps with the dizziness and just unsettling feeling in my skull as my brain swells. We will see when it’s time for the scans again if it is helping kill the actual cancer cells. For the liver and lungs I have done Artisunate IV twice a week. This is a malaria drug that has clinical studies showing it kills metastatic breast cancer. That together with listening to music that gives me goosebumps all day every day, forcing myself to spend with with other people and not withdrawing, eating from earth and looking at the good in any situation, person place or thing is why I’m still here right now. It’s not everything but I hope this can help my sisters dealing with a hormone positive diagnosis. Girl – start with those ovaries! So far so good. Please take care – and check out this planner because it’s REALLY helped ease my neurosis, provided critical inspiration hope and information, and gives me something nice and productive to geek out on in the waiting rooms. THE CANPLAN!!!!!!! 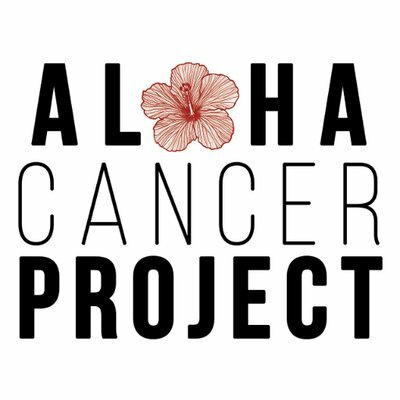 Thank you again to Sharon and her Kickstarter backers for sending Aloha Cancer Project some planners! We got them in the right hands through OnCare Hawaii and hopefully are really saving people. Love you. Be well. Make it a great day ( I used to think that was a kind of cheesy thing to say until I learned that YOU TOTALL CAN! ).